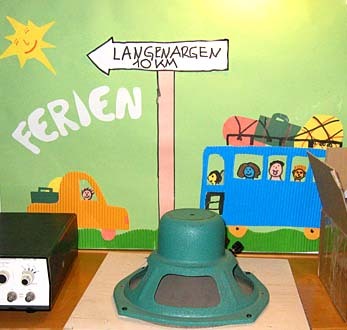 Hi Ho, Hi Ho, It's Off to Langenargen We Go!!! Even though the drawing doesn't have our tireless tour guide and driver quite right, Christian drove our little minibus from Zurich, on the autobahn, across Lake Constance on a ferry, and thence to the church camp where the European Triode Festival was held. By the way, "church camp" will give a completely misleading impression to North Americans, who think of a rustic, not say dilapidated, dump when the word "camp" comes to mind. 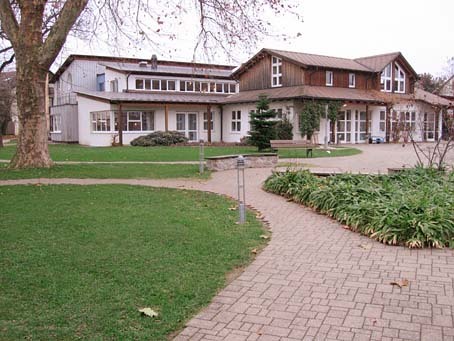 Even though it is run by the Diocese of Stuttgart for low-income parishioners, this is a resort with very nice private rooms, not a camp. The rooms were very nice, the setting was tranquil, and the conference center was quite deluxe. European domestic technology, I regret to inform Americans, has now surpassed ours. 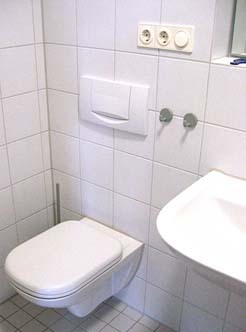 We used to make snide jokes about European toilets and toilet paper, well laugh no more. They're ahead of us in the domestic-tech department - even in a church camp! You walk from room to room in the conference center and the light system senses your motion and turns on automatically, and then politely waits five minutes after you leave before the room lights go off. The fan in the bathroom worked the same way - it took me some time to realize that although initially triggered by the light switch, it turned off on its own schedule. As for the food - well - lets just say it was ample and delicious, with the widest selection of beverages imaginable. 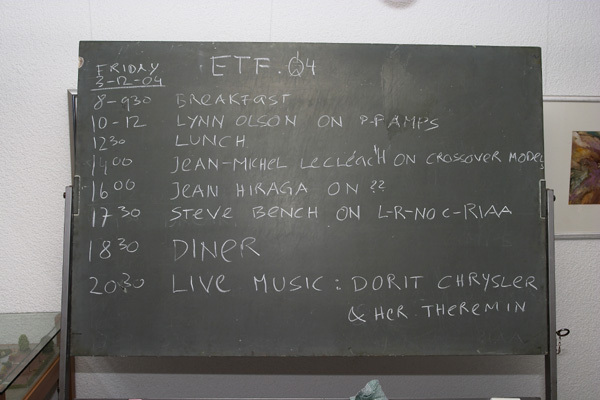 So the ETF was in a very comfortable setting, much nicer than most American hotels, deep in the countryside, far from noisy freeways or airports. I liked the furniture - in the US it would be called "Swedish Modern" and found only in specialty stores in the larger cities, but standard issue here. Simple but very well-finished woodwork in a minimalist way - so different than the obviously fake antiques and the Las Vegas motel-kitsch of American furniture stores. OK, my skeptical American readers, you didn't believe me about the domestic tech? Here's the photo. Note there's no tank, and the big wall-mounted button is a two-speed setting - a unobtrusive trickle or Niagara Falls, as you wish. 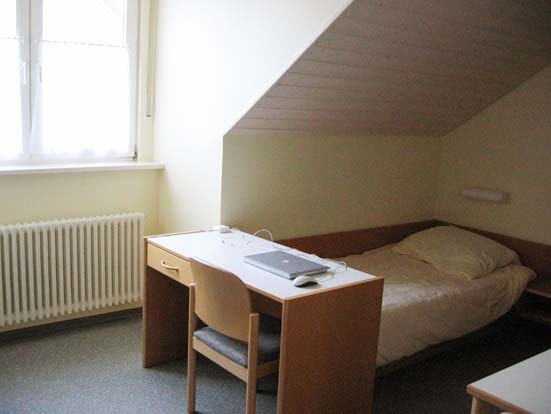 We saw the same type in our hotels in Zurich and Munich, so it's not anything special over there. The odd-looking round receptacles are German-style 230VAC outlets for shavers, etc. The little gray dinguses are towel hooks - although you could hang your towel on the specially designed bathroom heater, which had parallel bars for drying towels. The only downside of all this high-tech Euro efficiency is the sickly yellow color of the energy-saving compact flourescent lights - which are not used in retail shops. Didn't see any twist-off caps, either - gotta use an old-fashioned church key to get any bottles open. Since beer is the reference beverage in Germany, I guess that makes sense. 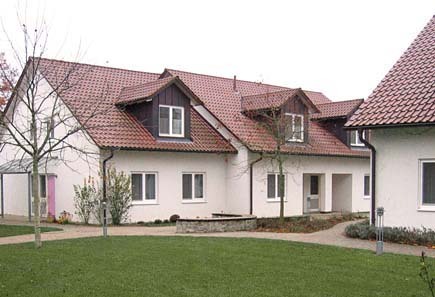 Our cottages at the ETF - my room was on the second floor, with the dormer window behind the tree. The camp can accomodate a lot of people, there seemed to be twelve or more of these cottages. 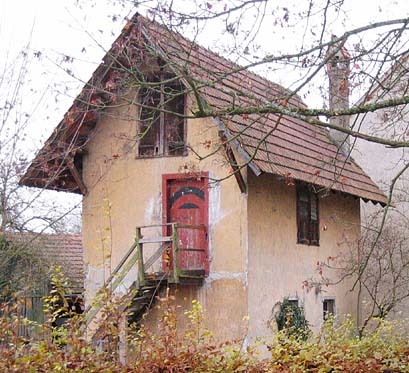 This strange little "Hansel and Gretel" house - if it's a house at all, it's hard to tell - was just outside the church camp, and part of the small summer-resort village of Langenargen. This was the kind of odd little building you'd see whizzing by in a car or train, just this time it was conveniently close by while I was walking around and taking pictures of the surroundings. 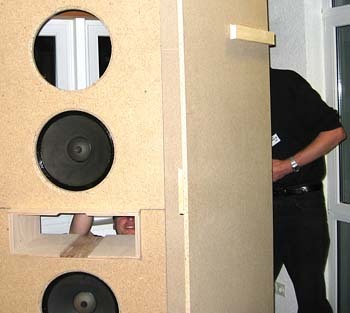 The infamous "Wall of Sound" by the Munich Triode Mafia, shown under construction. For a one-day (!!!) project, the precision was truly astonishing - no gaps or unevenly cut spots, everything fit exactly (they're German, right? ), and they even avoided making any marks on the ceiling beams by using a clever clamp system to attach the temporary wall to the beams. Lot of tricky trigonometry, too - note there aren't that many right angles to this thing, it's all compound angles. The carpentry didn't go to waste - the walls will be stored and re-used at next year's ETF. Some kind of consultation as the drivers are mounted - they borrowed Christian Rintelen's exotic wood TAD horns for the midrange and tweeter section. The TADs and Christian's active crossover were being unpacked as this photo was taken and were installed shortly afterward. 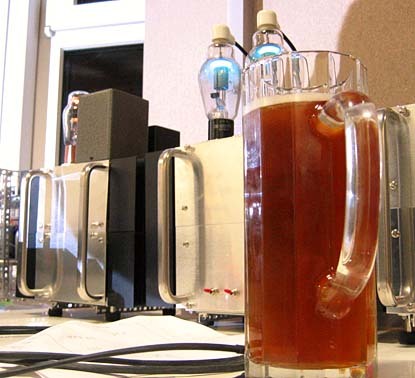 The big Munich Triode Mafia system is fired up for the first time - happy smiles all around at the big, BIG sound. 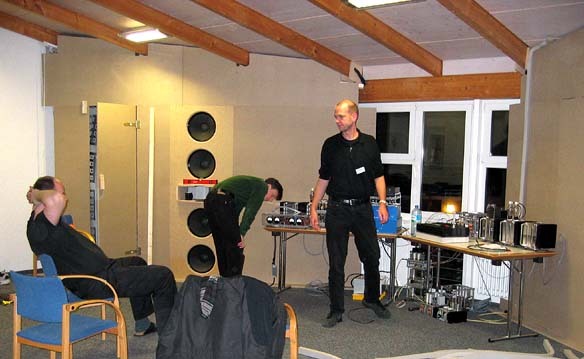 This is a four-way, active-digital-crossover system, with Christian's TAD supertweeter and mid-tweeter, and VinylSavor's (Thomas Mayer, the man in the middle) Altec midbass and deep-bass 15" woofers. With all these variables to set up, the MTM crew up stayed up late at night fine-tuning the system. And to help the MTM's concentration, lots of Munich's finest was at hand at all times. For Americans, whenever you see one of these 0.5 liter glasses, there's a small horizontal line scribed on the glass marking the 0.5L fill line, just to make sure the customer always gets full measure. Not only do you get the world's finest beer (OK, there are other good European beers, but Munich is right up there), but you always have all you could want - and local beers, by the way, are cheaper than the rather pricey mineral water in most restaurants. But no beer-drinking and late-night carousing for me - my talk, as you can see, was scheduled bright and early at 9 in the morning. Normally, I'm quite a night owl, but I was so jet-lagged for the first several days in Europe I was getting up in the pitch-dark at 4 and 5 in the morning. At the ETF, it was just as well - early morning is nice and quiet, and gave a quiet space to brush up the PowerPoint presentation and think of a few extra themes and little jokes for the ETF audience. Text and Pictures © Lynn Olson 2004, except where noted.